Magnacharger 2005-2008 Mustang w/ 4.6L 3V Supercharger Polished [01-12-65-011-PO] : Supercharger Superstore, Your Online Source for Vortech Superchargers, Paxton Superchargers, Procharger Superchargers, Magnacharger Superchargers and Techco Superchargers! • Drive system has self-contained lubrication of specially developed synthetic oil. • Air to water intercooled supercharger system includes the intake manifold intercooler core, secondary radiator, coolant reservoir, coolant circulation pump and all necessary wiring harnesses, hoses and clamps. 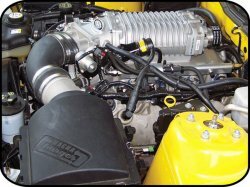 • Cast aluminum manifold replaces factory nylon intake. • Magna Charger 5th Generation MP112 supercharger with integral bypass valve. Same internal rotating assembly as Mercedes, Jaguar, Ford Cobra, Lightning, and Harley Davidson Truck for extended service life and quiet operation. • Internal bypass valve reduces parasitic losses while cruising for increased efficiency and economy. • Fuel system includes new fuel injectors, factory “push lock connectors” and computer re-programming for optimized drivability, and fuel mileage. • System comes complete with all necessary brackets, connectors, hardware and fuel system components including fuel line disconnect tools. • Instruction manual is complete with color photographs and is extremely user friendly with easy to read text. • Standard 3-year limited warranty on the supercharger system with optional 36,000 mile/3-year power train warranty availability for customer security and piece of mind.